Disney on the Brain: I'm Going to do Everything! And by everything, I mean I've going to ride every ride here at Walt Disney World. As I mentioned before, I've only been to WDW twice before, and while both trips were lengthy and packed full of rides and fun, I still haven't done everything at the parks. So I've decided to make that my goal for my time here during the Disney College Program, and to document my progress while I do it! Well, I'm at least going to have fun, hopefully you like hearing about it. And if not, well then my name is Clayton and this has been Tarzan's Treehouse. So, details. I'm posting this right now because if all goes well I should be going into the parks for the first time tomorrow night after Traditions. I'm going to take pictures and/or videos of my adventures, and probably post there up here one at a time, so not exactly at the same time I necessarily do them. Rather, I expect I'll do several rides on a day off and then spend the next week or so posting about it, but we'll see how it actually goes. I got the inspiration for this from the two guys who run Parkeology.com. They did a challenge back in 2014 called the WDW46 challenge. That was an attempt to ride every ride in WDW in one day, using only perks available to all guests, so pretty much just intense planning, Fastpass+, and Extra Magic Hours. I'm not crazy enough to try and do this all in one day, so I'm just kind of using their ideas about what counts as a ride to give myself a starting point. I've posted directly from their website below the exact list of what they completed for the challenge. You may notice I crossed Soarin' off that list. That particular ride has closed while a third theater is constructed and programming takes place in preparation to switch the film over to one showing scenes from all over the world instead of limited to only California. This will continue until the new film premieres in summer, long after I am gone in April. So already I'm down to 45 rides. As well. I am going to include shows as part of what I experience and document during my time here. Since no one likes failure, I'm not requiring all of these for myself, but they will definitely be included as a bonus of sorts. 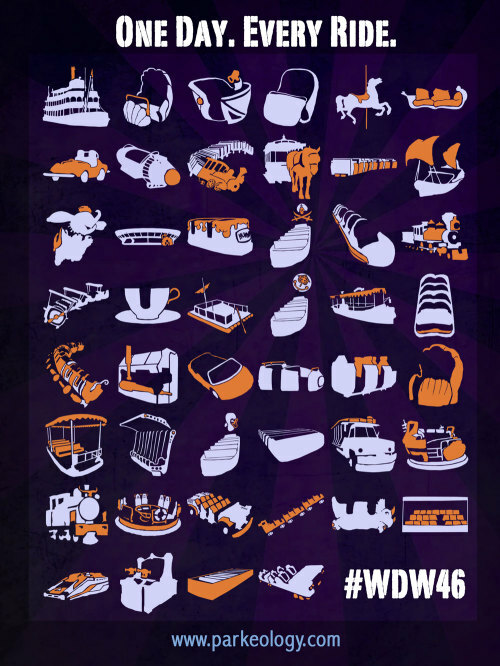 A record of the successful WDW46 run from Parkeology is captured here, and while it is rather lengthy, it's still quite an interesting read. Hopefully I'll see you back here as I start to record my progress. TTFN! Grabbing my virtual piece of paper to keep track. Even with two programs I still haven't done MK 1, 8, 20, 24; HS 4; and AK 7.